Beautifully detailed soft plush sitting Golden Retriever stuffed dog in the size of a real puppy. From Douglas. 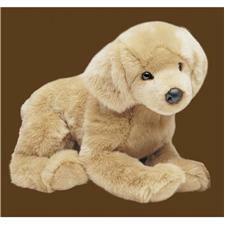 The Golden Retriever Stuffed animal measures approximately 16 inches. Find plush Golden Retrievers for bid at Ebay.